A small reminder that this is all about houses and not hold-to-maturity. I don't know exactly what hold-to-maturity is (though I'm pretty certain it's not the loving neighbour of mark-to-market) but I do know I wouldn't want any of it to appear in my tax paying life. So while the fleas in DC argue about who owns the dog here is a little graph on the state of the single home market in the US. While the stock-to-sales ratio and absolute sales are at levels that in the past might have looked a turning point high inventory is clearly a problem this time. You may have heard the fine analysis President Bush, always at home on economic matters, made on this very point. 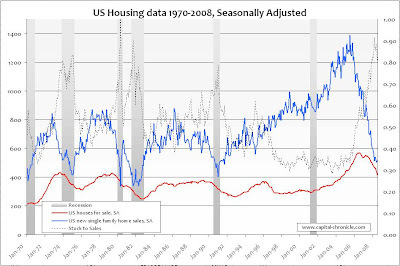 Previous inventory peaks have taken 1 to 3 years to trough from current levels. Given the destruction this cycle has wrought on lenders' balance sheets the top end of that historical guidance looks the minimum required just to get some stability back into the mortgage market (alone). This is unfortunate, but it should serve as a wake up call to all American investors. If you want to protect your money, you need to diversify and invest at least some of it overseas. These are hard times for American investing firms. I personally use offshore bank accounts and they have helped me with diversification and asset protection. If you want to read more on why offshore investing is smarter, feel free to visit my website.